How Much Does Tracfone Data Cost? 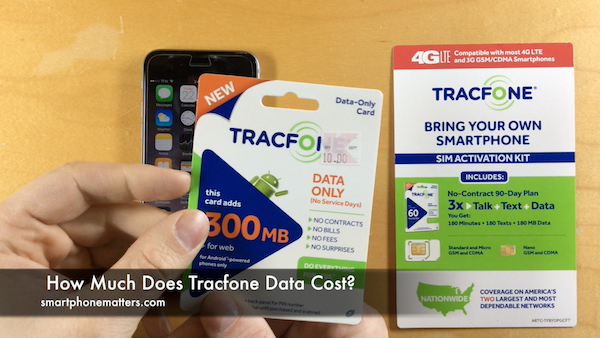 In the video I talk about the cost of tracfone data. In my previous video I showed how I refilled the data on my Tracfone Bring Your Own Smartphone account. I bought a $10 300 MB traacfone data only refill card and I used the Tracfone My Account app to refill the data on my plan. I agree that when you look at the cost per MB this is very expensive. I needed to add data to my account, I didn’t need a lot of data so I went to Kmart and bought the cheapest cards I could find which was $10. Looking back on my trip to Kmart I don’t actually remember how may different data refill cards they had. I bought the $10 300MB card and I remember the $19.99 750 MB card but that’s it. I did a little math..
note that 1GB of data is 1000MB so the 2GB data card is 2000 MB of data and the 4GB data card is 4000mb of data. I also wanted to mention that this data doesn’t expire as long as you keep your phone active, that is have remaining service days. So what’s the takeaway from this. Well there are several points. Tracfone data is expensive. The prices ranges from $12.50 to $33.33 per GB. I’d say $10 GB is a fair market pric, granted it doesn’t expire. Data Refills cards in stores are not the best value. In my trips to kmart, target, and walmart. I did not see any data cards larger than the 750MB card. And I checked the walmart web site to see if I could find the 2GB or 4GB data cards in store and I could not. They were only available though the website for email delivery. So if your rely on filling your phone using store bought cards, you’ll pay the highest cost for data. This might be an issue for people without a credit card, who can’t easily buy online. Now all this said, if you don’t need 4GB of data and only need a little data or are on a very tight budget, then spending $10 or $15 to have some data on your phone is a lot less than $30 to $50 to buy 2 or 4 GB of data and you may not want to pay for data now that might never use or it would take you a long time to use. If you need a lot of data you may be better of looking at an unlimited data plan from another prepaid wireless company like Straight Talk, Net10, Cricket or others. You got it right. I encourage people to do the math and pick the wireless plan that meets there needs. Tracfone is very affordable for people with limited data needs and who don’t spend a lot of time talking on the phone. For Tracfone phones, you can buy 1GB of data for $10 under the “Smartphone and BYOP Only Plans,” and the data doesn’t expire. yes. buying data online is a better deal than in the store.